Cooking Mama: Mama Kills Animals (Cooking Mama, the Unauthorized PETA Edition)	PETA (People for the Ethical Treatment of Animals) (U.S.A.), PETA (People for the Ethical Treatment of Animals) (U.S.A.), 2008 Play it Now ! "Beware, while the gory aspects of the game are rendered through cartoon drawings, the game also features bonus videos describing the animal conditions in industrial food producation with very hard and shocking scenes." A remake created by a vegetarian association of the "Cooking Mama" game (a game where you cook various recipes). The games stress out the animal cruelty involved in the industrial producation of animal-based food. 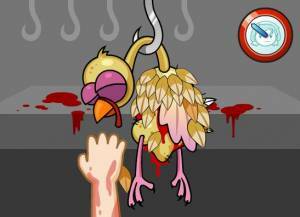 The game focuses on the gory and dirty side of the preparation of a Thanksgiving or Christmas turkey. 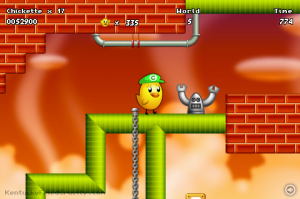 Beware, while the gory aspects of the game are rendered through cartoon drawing, the game also features bonus videos describing the animal conditions in industrial food prodication with very hard and shocking scenes.